As this Newsletter reveals, the Oñati Institute is in good health. The 2016-17 Master Course was no doubt successful. All our students proved very satisfactory and there are good chances that they may have access to further steps in the world of research. Some were indeed brilliant and produced works of significant interest, which might turn into publishable scientific contributions quite soon. Alexander Brandão and Florencia Radeljak scored very high, winning the prizes, respectively, as the best student of the Academic Year and as the author of the best final thesis. A new master course has taken a promising start. Fourteen students from the most diverse parts of the world enrolled and are currently running their courses. The IISL staff has had some changes. 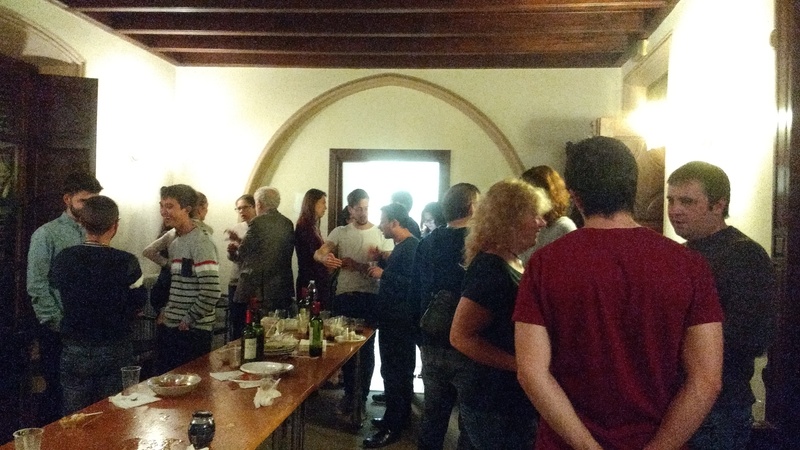 Some members have left, due to either retirement or new professional projects: José Antonio Goyenaga, our general manager since the very beginning; Elvira Muñoz, member of the founding team of the Institute and head of librarians; and Cristina Ruiz, the publications officer. To all three of you, thank you for your work and your dedication to the Institute. Maite Elorza Plazaola and Leire Kortabarria have joined the IISL; Maite is the new manager, and Leire is in charge of the Institute's publications. Welcome! The Friendship programme is running again! De forma paralela al master, ha comenzado también otra edición del programa Friendship, cuyo objetivo es fomentar la amistad y el intercambio cultural entre los estudiantes y los autóctonos. Como cada año, se hizo una recepción en la residencia Antia. Este año participa en el programa Friendship gente de Oñati, Mondragón y Legazpi, entre otros sitios, y en todo momento está abierta la oportunidad de participar. Para ello, hay que contactar con Susana Arrese. The 2016/17 International Master students have all obtained their degree. Zorionak! 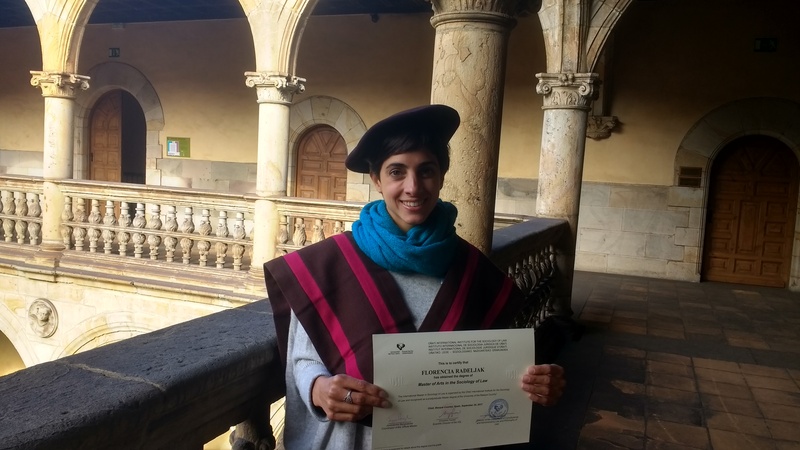 Florencia Radeljak, from Argentina, has been awarded the André-Jean Arnaud Prize, given to the student who offered the best performance in the 2016/17 Master’s Program. The workshop programme for next year is already closed. Check the full programme [+info]. The deadline to apply for 2019 workshops is 9 February. Check the regulations for applications [+info]. Contact person: Malen Gordoa (malen@iisj.es). El programa de workshops del año que viene ya está cerrado. Consúltalo [+info]. 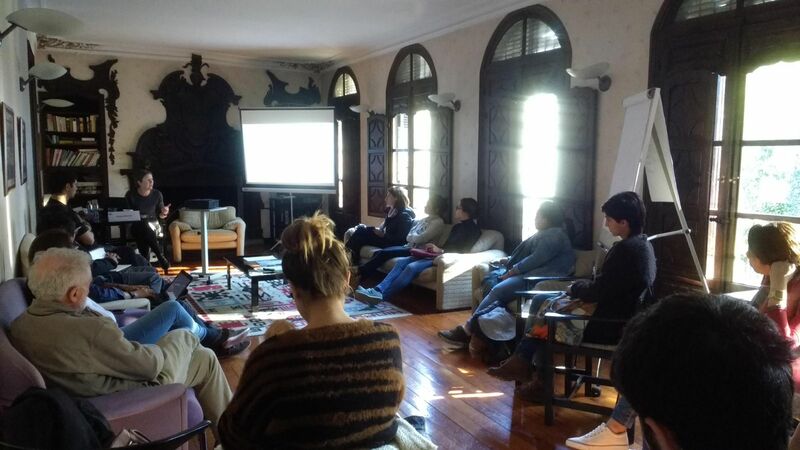 El plazo para presentar solicitudes para organizar workshops en 2019 termina el 9 de febrero. July-September 2017 - Issue edited by Prue Vines (University of New South Wales) and Robyn Carroll (University of Western Australia). 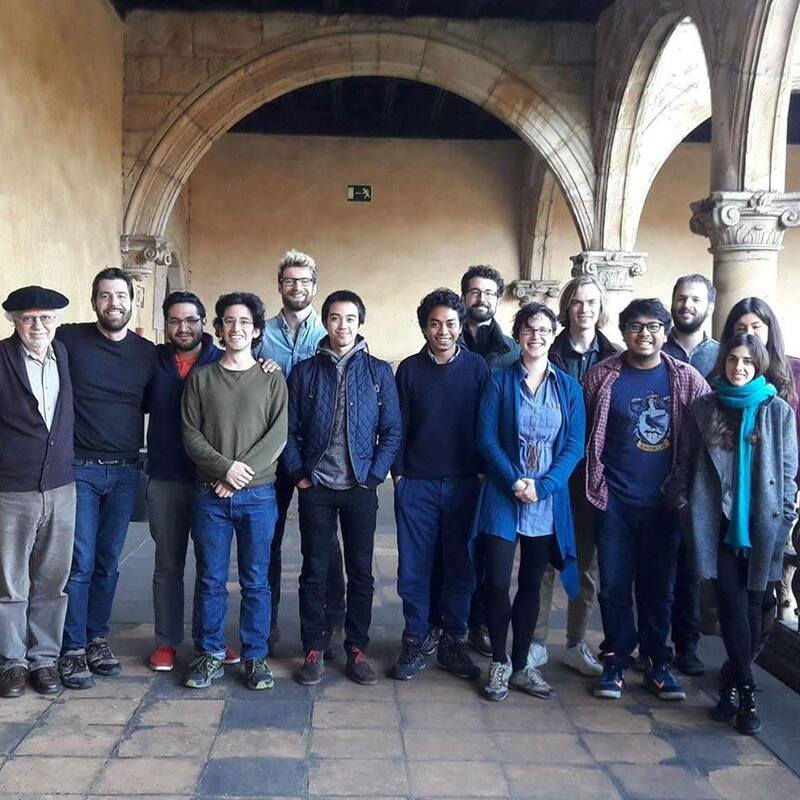 Alberto José Olalde Altarejos, Angélica Cuellar Vázquez, Claudio Colaguori, Eduardo Jorge Prats, Giuseppe Campesi, Gloria Amparo Rodríguez, Jairo Vladimir Llano Franco, Joxerramon Bengoetxea, Juan Federico Arriola, Lucio D’Alessandro, Lynn Mather, María José Bernuz Beneítez, Mónica Acosta, Olimpia Giuliana Loddo, Sharyn Roach-Anleu, Ulrike Schultz and Vincenzo Ferrari. Helburua Oñatiko herriari ekarpena egiten dioten Gizarte Zientzien eta Zuzenbidearen alorreko ikerketa proiektuak sustatzea da. Epemuga: Urtarrilak 31 [+info]. Convocatoria de beca para proyectos de investigación de Ciencias Sociales y de Derecho que supongan una contribución para el pueblo de Oñati. Fin de plazo: 31 de enero [+info]. 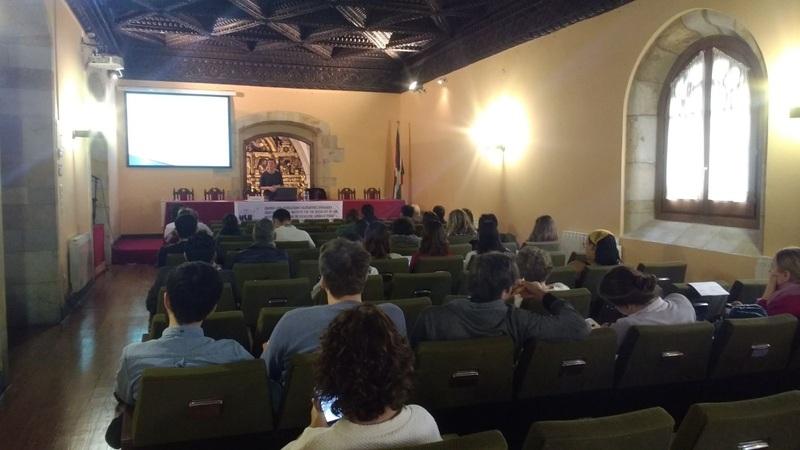 Social science and Law-related projects contributing to the town of Oñati and with a close relation to the socio-legal aspects of local self-government, civic activity and/or national identity will be funded. Deadline: January 31 [+info]. There will be sessions especially organised so members of the Oñati community share their research findings in the next conferences organised by the Law and Society Association in Toronto (June 7-10, 2018), International Sociological Association in Toronto (July 15-21, 2018), and the Research Committee for the Sociology of Law in Lisbon (September 10-13, 2018). You can find more information about these sessions in Forum section of the Oñati Community website. The Oñati Sessions aim to open a new window of interaction between the IISL and the socio-legal community in general. RCSL will organize its Annual Meeting in Lisbon, on the general theme “Law and Citizenship Beyond the States”. The meeting is co-sponsored by the Sociology of Law and Justice Section of the Portuguese Sociological Association, and is organized by Dinâmia’CET, a research unit of the University Institute of Lisbon (ISCTE-IUL), with the support of CES (Coimbra), CICS.NOVA (Braga, Lisbon), CIES (ISCTE-IUL, Lisbon), and CRIA (Lisbon, Braga). The call for sessions and papers will be open from 15 October to 15 December. From June 7-10, 2018 will be held in Toronto, Canada, the Annual Meeting on Law and Society with the theme "Law at the Crossroads -Le Droit a la Croisée des Chemins". A Oñati Session wil be organized by Vincenzo Ferrari during the ISA WORLD Congress. 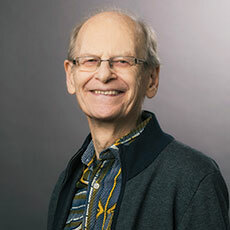 Lamentamos profundamente el fallecimiento de Gordon Woodman, profesor de Derecho de la Universidad de Birmingham. Era experto en derecho de África, especialmente de Ghana, y en la situación legal de los africanos en el Reino Unido. Participó en workshops del IISJ de Oñati y en subsiguientes publicaciones de Oñati International Series in Law and Society (Hart-Bloomsbury); por ejemplo, en M.C. Foblets and T. von Trotha, eds., 2004, Healing the Wounds. Essays on the Reconstruction of Societies after War y en M.C. Foblets and A.D. Renteln, eds. 2009, Comparative Perspectives on the Cultural Defense. Nuestro pésame a su familia, amigos y compañeros de trabajo. We are deeply saddened by the death, on 24 October, of Gordon Woodman, professor of law at Birmingham University. Prof. Woodman, among other things, was an expert on law in Africa, especially in Ghana, and on the legal situation of Africans in the UK. He participated in workshops at the IISL and his work was published within the Oñati International Series in Law and Society (Hart-Bloomsbury); for example, in M.C. Foblets and T. von Trotha, eds., 2004, Healing the Wounds. Essays on the Reconstruction of Societies after War and in M.C. Foblets and A.D. Renteln, eds. 2009, Comparative Perspectives on the Cultural Defense. Our condolences to his family, friends, and colleagues.